Encourage your child to build their confidence through expressive communication, creativity, collaboration and cognitive development with the holiday programmes available at Julia Gabriel. The centre has a line-up of exciting programmes ready to capture the imagination of every child! Join Oliver, a famous writer who seems to be having trouble completing his new collection of fantasy stories because his characters keep disappearing into a magical land with new personalities. All budding fantasy writers are invited to join Oliver as he journeys through the Wonderful Land of Stories to find his characters and complete his narrative. Your child will enjoy a five-day journey where they discover the world of fantasy and create stories of their own which will be compiled into a Fantasy Story collection that will be shared at a Young Authors’ Gallery on the final day! The Wonderful Land of Stories will be held from 26 November to 7 December at 9am to 11.30am / 10.30am to 1pm / 12pm to 2.30pm / 2.30pm to 5pm / 3.30pm to 6pm. The session will be held for two weeks at Julia Gabriel Forum and Julia Gabriel Tampines Mall respectively.The session is open to children aged four to six years old. 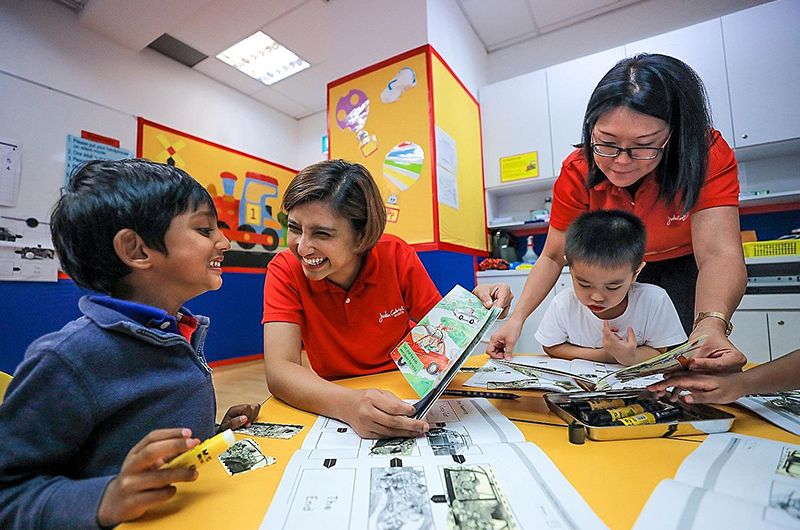 The transition to Primary One is an important milestone in the life of preschoolers. If your child is about to embark on this new chapter of their lives, arm them with the necessary skills with this five-day P1 Preparatory Camp. In a nurturing and stimulating environment, your child will learn phonetic skills, grammar skills, writing conventions that includes punctuation and sentence structures, spelling tips, good handwriting skills and engage in comprehension activities to better understand the 5Ws and 1H. The P1 Preparatory Camp will be held from 26 November to 7 December at 10.30am to 1pm / 12pm to 2.30pm / 2.30pm to 5pm / 3.30pm to 6pm. The session will be held for two weeks at Julia Gabriel Forum and Julia Gabriel Tampines Mall respectively.The session is open to children aged five to six years old. Has your child ever dreamt of becoming an investigator and solving crimes? This camp would be the perfect chance for them to help solve a mystery! Join a team of investigators as they try to solve the mysterious disappearance of TLR News travel and lifestyle reporter, Leslie Rushmore. Your child will undergo fun basic training in combat and defence and even get a chance to interview various suspects and uncover the clues that may lead them to Leslie. They’ll also complete their very own Investigation Report, which will be presented on the last day of the camp. Missing Person! will be held from 26 November to 7 December at 10.30am to 1.30pm / 12pm to 3pm / 2.30pm to 5.30pm / 3pm to 6pm. The session will be held for two weeks at Julia Gabriel Forum and Julia Gabriel Tampines Mall respectively.The session is open to children aged six to eight years old. Help your child to cultivate their passion to help save the planet at this five-day interactive camp where they’ll assist Mr Temasek by giving him ideas that can help his new company, ‘Save the Earth One Idea at a Time’. Your child will learn how to plan a campaign, conduct interviews, write informative articles, and present ideas persuasively. They’ll also pick up skills on presentation when they share their compiled findings with Mr Temasek and potential sponsors on the last day. Saving Planet Earth will be held from 26 November to 7 December at 10.30am to 1.30pm / 12pm to 3pm / 2.30pm to 5.30pm / 3pm to 6pm. The session will be held for two weeks at Julia Gabriel Forum and Julia Gabriel Tampines Mall respectively.The session is open to children aged eight to twelve years old. 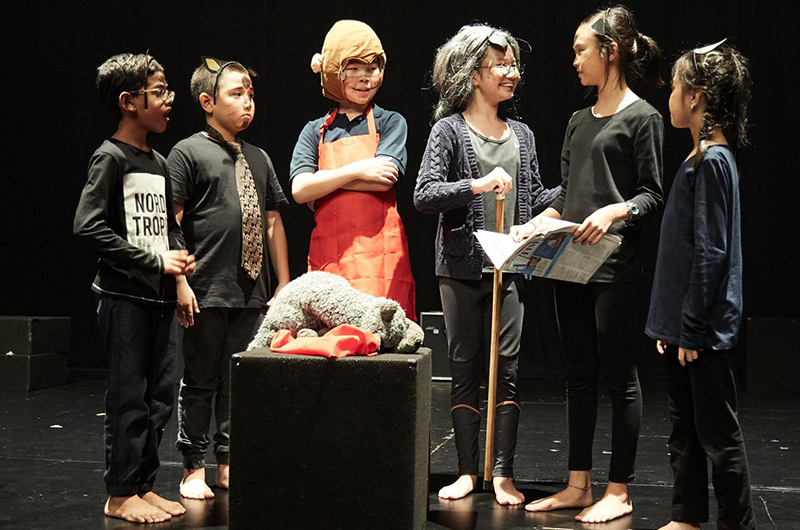 Let your child be a part of an ensemble cast as they explore a variety of stagecraft disciplines which include acting, voice work and choreography. Through this thought-provoking five-day programme, your child will gain a sense of confidence and achievement that you’ll see when they put on a Roald Dahl themed performance with the director and their fellow cast members. Magical Moments will be held from 26 November to 7 December at 3pm to 6pm. The session will be held for two weeks at Julia Gabriel Forum. The session is open to children aged six to twelve years old.